Prevention of the spread of S. aureus colonization within the nursery is a challenging prospect. Neonatal staphylococcal skin infections include bullous impetigo, sta-phylococcal scalded skin syndrome, and toxic shock syndrome. 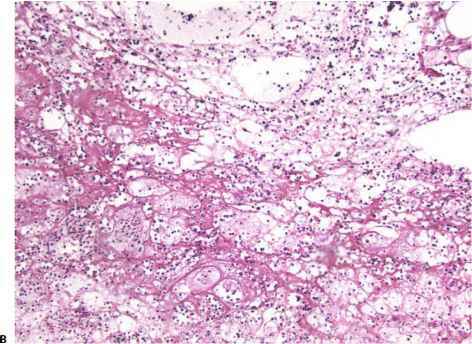 Staphylococcal pneumonia is associated with significant mortality and is characterized by the formation of microabscesses, which may rupture and lead to empyema, and by the formation of pneumatocoeles because of obstruction of terminal bronchioles. Osteomyelitis is infrequent and manifests differently in neonates than in older children. In neonatal osteomyelitis, the membranous bones (scapula, maxilla) are affected as well as the long bones. In addition, neonates with osteomyelitis may not exhibit fever or laboratory abnormalities suggestive of infection. Staphylococcal endocarditis is rare in neonates. An active impetigo of the scalp, on rare occasions, can produce enough inflammation to cause hair loss and may simulate a kerion. Hairs can be readily epilated but come out by the root rather than by breakage. Whenever there is a question, hair KOH exam and fungal culture are indicated. Patches of nummular eczema, early lesions of psoriasis, patches of impetigo, pityriasis alba in its early inflammatory phase, and the herald patch of pityriasis rosea can all be confused with TC. When other diagnostic features of these conditions are absent, a simple KOH exam should distinguish them. Nonbullous impetigo Thin-walled, small, transient vesicles that rupture easily (see Photo 1) burnished, moist, deep-red macules 0.5 to 1.0 cm that may enlarge as they coalesce (see Photo 2). 2. Bullous impetigo Bullae 1 to 2 cm in size that are clear at first and later become cloudy (see Photos 3,4) scaling and red plaques 1 to 2 cm or more in size that show central resolution (see Photo 5). Various acute bacterial infections may affect the skin. These include impetigo, erysipelas, cellulitis, furuncles, carbuncles, anthrax, diphtheria, and various mycobac-terial infections, including tuberculosis and leprosy. Of these only impetigo (in which a small area is infected) or furuncles, which are both caused by Staphylococcus aureus, are amenable to topical treatment. In impetigo, which is more common in young children, an inflamed erythematous area with a yellow crust may develop on exposed skin. Local treatment with antibiotic washes, such as Phisomed or Hibiscrub, and topical mupirocin or fucidic acid (Fucidin) ointment may be sufficient. More extensive areas, larger than a few centimetres in diameter, will require treatment with systemic antibiotics. Impetigo (Nonbullous) Both diseases are common in the central facial region, and both begin with small clear vesicles on an inflammatory base. Herpetic lesions tend to remain fixed and discrete, and the vesicles are small, 1 to 2 mm across, tightly grouped, and persist for longer periods. Facial HSV occasionally develops secondary impetigo, causing some diagnostic confusion. A smear with a Gram stain will often show bacteria with cases of impetigo. A Tzanck smear of a blister base will show herpes virus cytopathic effect with herpes labialis. RIF test is also positive with herpes. Bacterial and viral cultures are expensive and are seldom justified. Action Kinetics Cefuroxime axetil is used PO, whereas cefuroxime sodium is used either IM or IV. Uses PO (axetil). Pharyngitis, tonsillitis, otitis media, sinusitis, acute bacterial exacerbations of chronic bronchitis and secondary bacterial infections of acute bronchitis, uncomplicated UTIs, uncomplicated skin and skin structure infections, uncomplicated gonorrhea (urethral and endocervical) caused by non-penicillinase-producing strains of Neisseria gonorrhoeae. Early Lyme disease due to Borrelia burgdorferi. The suspension is indicated for children from 3 months to 12 years to treat pharyngitis, tonsillitis, acute bacterial otitis media, and impetigo. Contraindications Hypersensitivity to cephalosporins. Use in infants < 1 month. Acute otitis media, impetigo. Children, 3 months to 12 years 30 mg kg day in 2 divided doses, not to exceed 1,000 mg total dose day, for 10 days. Free version of Fast Impetigo Cure can not be found on the internet. And you can safely download your risk free copy of Fast Impetigo Cure from the special discount link below.